The AES Convention returned to Los Angeles last week, sporting a theme of “Immersed in Audio,” and it fit. As soon as visitors walked into the L.A. Convention Center, they were surrounded by the latest in everything pro audio, from recording, to post, to live sound, to audio for virtual reality and augmented reality. In short, if it had anything to do with the cutting edge of professional audio, it was there, waiting to be discovered, seen, learned, and most of all, heard. Left to right: AES 141st Convention co-chair Michael MacDonald; Recording Academy Producers & Engineers Wing managing director Maureen Droney; panel moderator Glenn Lorbecki; and panelists Eric Schilling, Jeri Palumbo, Paul Sandweiss, James Stoffo, and Leslie Ann Jones. Unlike the last time the convention was in L.A., the exhibitor floor opened right away, which allowed attendees to hit the ground running, taking in all the latest and greatest offerings presented by audio manufacturers. At the same time, there was a seemingly endless of supply of workshops, papers, panels, and more to see, plus back-to-basics how-to presentations at the Live Sound Expo and Project Studio Expo, each one filled with insights and illustrated with real-world examples. “We’ve been really gratified how the L.A. community has embraced the show,” mused Bob Moses, executive director of the AES on the first day of the convention. “There’s a lot going on this weekend—evening events and so on—so the community has coalesced around the convention, and that’s gratifying to see.” Bolstering that, while full numbers have not been announced yet, the pre-registration for the show was higher than the last time it was held in Los Angeles (2014), and reportedly neared the levels of the East Coast convention. If the event was a hit for the Audio Engineering Society and a boon for attendees, it wasn’t bad for the exhibitors either, as an upbeat vibe permeated the exhibit floor throughout the three days it was open. "Here at AES, we get to spend more time with customers, and for us, it's a quality-over-quantity experience," said James Capparelle, marketing manager, USA for DPA Microphones. "The crowd that AES attracts—it's the Audio Engineering Society, after all—means that we get a lot of engineers, and this is their passion. Everyone is here because they want to be; it's not a retailer audience like at other shows; this one is for our crowd. It's the engineers who are using our microphones, and that's who we like to market our products to: professional users." The convention hosted its trademark Platinum panels. The engineering edition was hosted by Michael Romanowski with panelists Chuck Ainlay, Lynne Earls, Bob Ohlsson, Andrew Scheps, and Ryan Ulyate. Meanwhile, Platinum Mastering was moderated by Mix Magazine's Tom Kenny, with panelists including Adam Ayan, Emily Lazar, Gavin Lurssen, Andrew Mendelson, and Michael Romanowski. 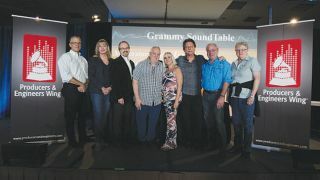 Also on the docket, the Recording Academy Producers & Engineers Wing hosted its Grammy Soundtables: Life in the Hot Seat—Audio Production for Live Global Telecast Events,” focusing on the myriad moving parts and zero-error margins of some of the biggest live broadcast events on the planet. Moderated by producer/engineer/audio entrepreneur Glenn Lorbecki, the session featured panelists noted for helping audio for the Grammy Awards, Emmys, Oscars, and sports events from the NFL, including the Super Bowl, to NASCAR. On Sunday, the final day, there was no exhibit floor but the AES experience continued with plenty of special events, workshops, and other offerings. With the show now over, for those who missed it or didn’t get their fill of everything audio after that, there's always next year, when the AES Convention returns to the Jacob Javits Convention Center in New York City (co-locating with NAB NY for the first time, no less) on October 18-19, 2017. Clive Young is editor-in-chief of Pro Sound News and ProSoundNetwork.com.